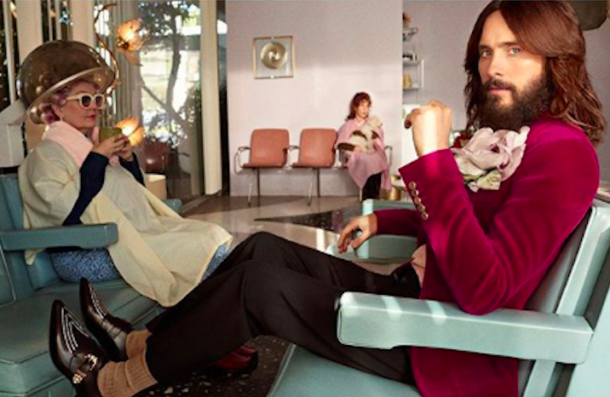 The 47-year-old part-Spanish American actor/singer appears opposite singer Lana Del Rey in Gucci’s new Forever Guilty campaign. In the video, Leto and Del Rey go about mundane tasks like folding laundry and food shooping. Being a Gucci ad, things get a little surreal when an ostrich starts walking down the grocery store aisles and a tiger is roaming around the laundromat. Courtney Lovemakes a surprise cameo as a waitress at a diner — one of the stops the duo makes during their day of running errands. The campaign by Glen Luchford depicts the pair as “individuals who live and love outside of social conformism to embody the #GucciGuilty fragrances,” according to a Gucci Beauty Instagram post. Del Rey and Leto were announced as the faces of the campaign and even attended the Met Galatogether last year.